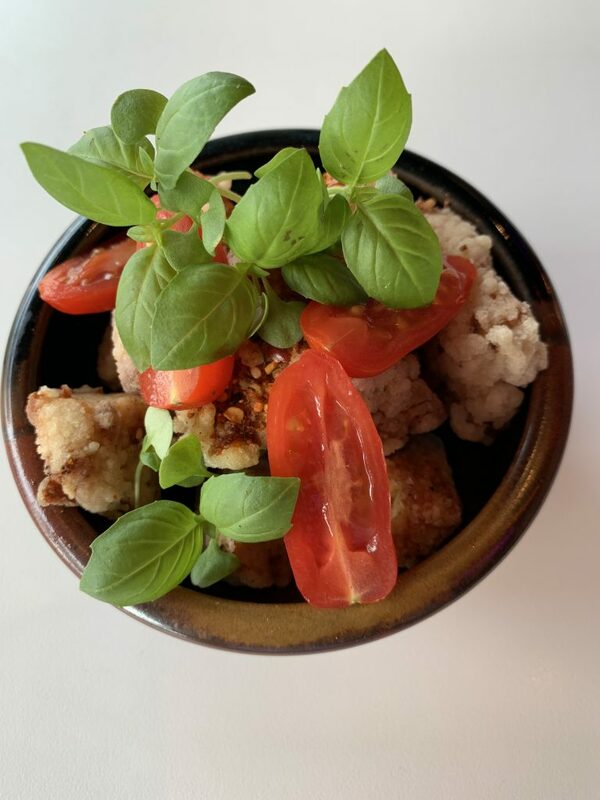 Thanks to my foodie friend I met through Instagram, @AustinFoodAdventures, I had the opportunity to try out so many dishes on Lucky Robot’s lunch menu. 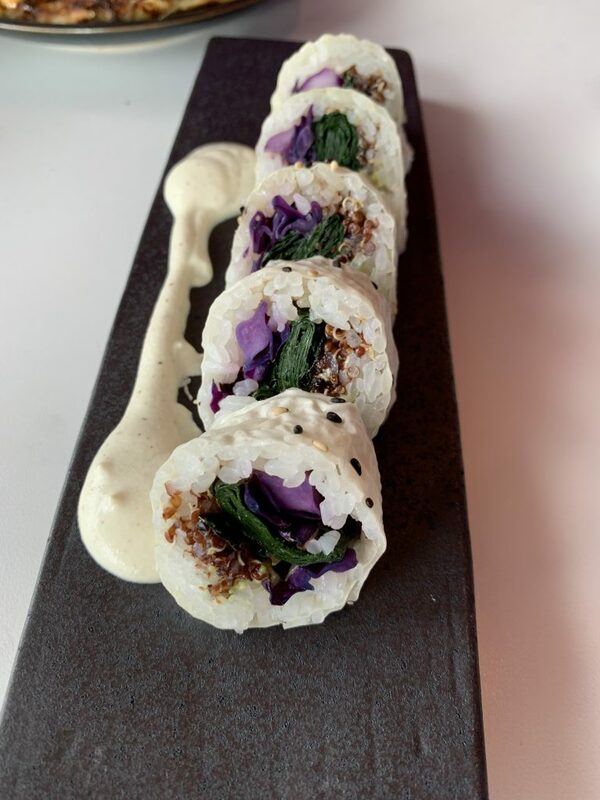 Lucky Robot has been on South Congress for as long as I can remember but only recently has it come to my attention that they’re Austin’s first sustainable sushi restaurant. I don’t know about you, but I’m hyper aware of how our food choices impact the environment and what is left of Mother Earth. It’s great to support a local restaurant that is offering up dishes with only environmentally-responsible seafood. By making that choice, they’re protecting the ocean and its inhabitants! I’ve dined at Lucky Robot for dinner several times and finally tried out their lunch. The Chirashi Bot is only available during lunch and that’s why we chose lunchtime to visit! Boy am I so glad I got my hands on that beautiful bowl of all the sashimi! Gah, so dang good! 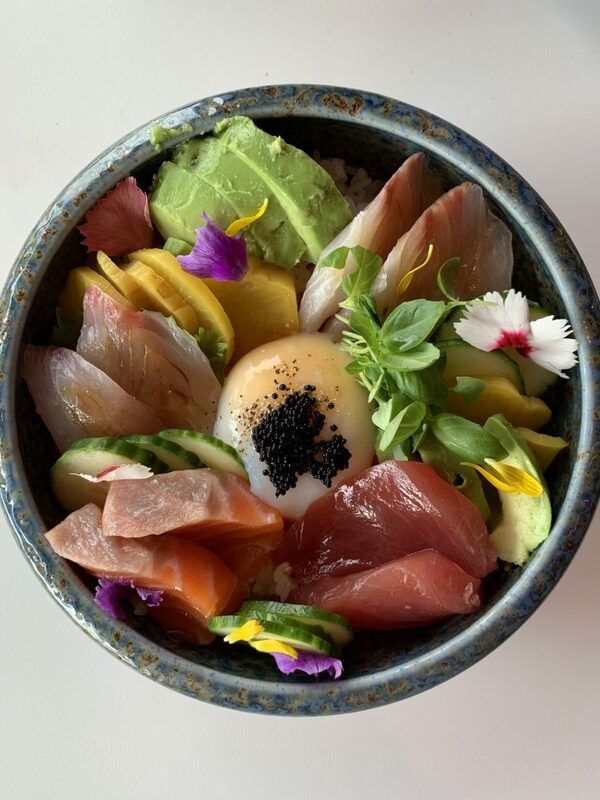 Feast your eyes on this bowl of tuna, salmon, amberjack, and striped bass sashimi on a bed of sushi rice, avocado, English cucumbers, daikon picklets and a 144 degree egg! I’ll be eating this for lunch everytime I visit Lucky Robot…believe me! The Schoolgirl Bowl rings all things comfort. Loaded with chicken breast, scallions, and a ton of veggies, eat this dish WARM and savor every bite. I love a good Okonomiyaki so when I saw they had the Nomnomiyaki on the menu, we had to order it. 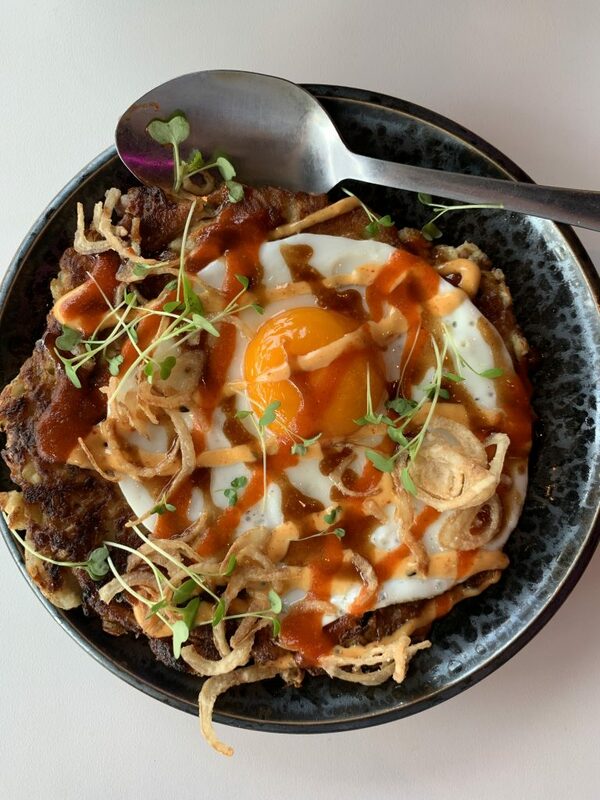 A Japanese savory pancake with PORK BELLY, napa cabbage, a sunny side up egg, spicy mayo, and all the goodness – you’re not going to want to leave a single drop! Whenever there is Chicken Karaage on the menu, I get it. These spicy Japanese-style chicken nuggets are to die for! Where my Vegan friends at? The Farmbot features local farm box veggies, red quinoa, avocado, CASHEW CHEESE in a soy paper – I COULD HAVE EATEN ALL OF THIS BY MYSELF! 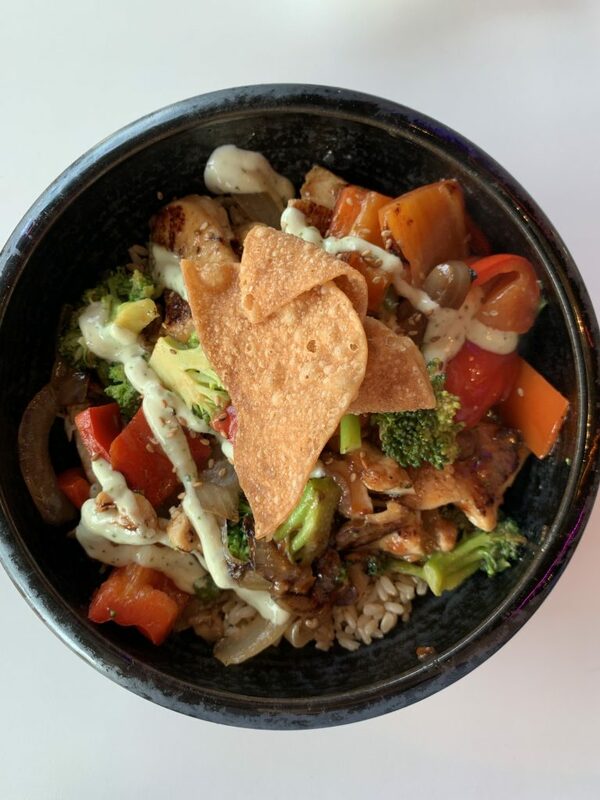 Next time you’re out strolling Soco, stop at Lucky Robot and order a ton of Japanese goodness! You won’t go wrong with whatever you choose and you can rest easy knowing you’re eating sustainable fish too! And if you needed even more of an incentive to go — Happy Hour is M-F from 4:00-6:00PM and they’ve got a weekend happy hour during their Tokyo Brunch from 10:30-11:30AM (brunch is 10:30-3:00PM). 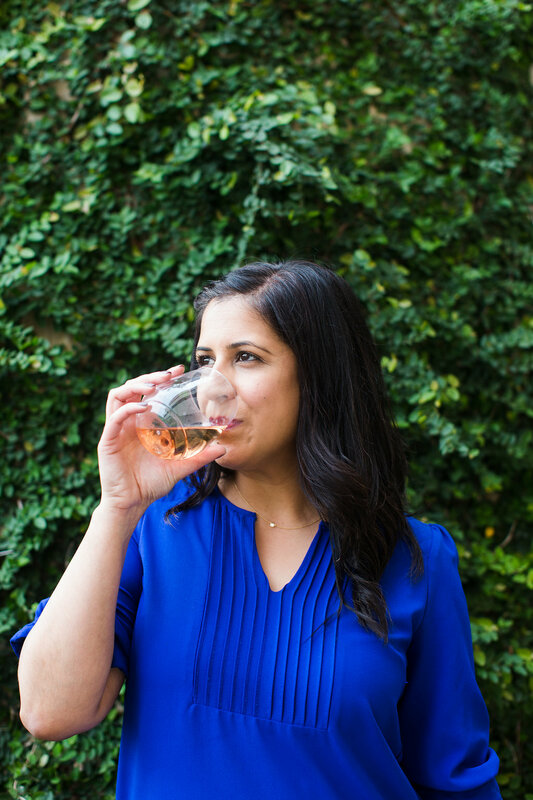 If you need a lunch or happy hour date, hit me up! This entry was tagged atx, atxbites, atxeats, austin, austinfoodie, dinner, happyhour, japanese, karaage, lunch, okonomiyaki, soco, sushi, sustainable, sustainablefish, visitaustin.